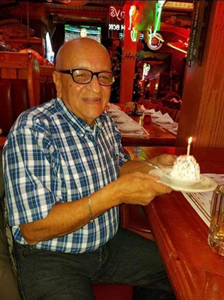 Hiram Torres, a man who lived a vibrant life, was taken by God April 4, 2019. He was a loving Father, Grandfather, Brother, Uncle, Primo, and a friend to all that knew him. He never allowed anything to stand in his way of living. Traveler he was, traveling to many parts of the world creating memories and shareable moments. He left a good mark on the world, beginning with participating in the United States Army to ending with trying to satisfy everyone in his life. He will always remain in our hearts and forever in our prayers. R.I.P Hiram, you’ll be missed. His Children: Hiram Jr., Leslie, Jadelyn, Zuleyka. To share your memories of Hiram or to leave a special message for his family, please click the Share Memories button above. For additional information contact the Funeraria at 1-787-891-2166. Add your memories to the guest book of Hiram Torres. Words fall short of expressing our sorrow for your loss. Are hearts are with you.